RV Education 101 just made it easier for you to learn about YOUR RV! We took 10 of our individual PDF File Ebook titles and put them together into a full set for you. You SAVE a significant amount of money with the set discount. 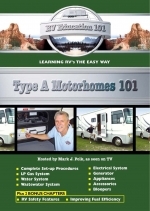 This DVD covers ALL types of RVs: motorized and trailer. We show you step by step instruction as it applies to an RV. 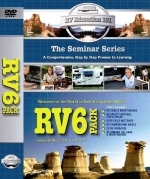 A 4 DVD Box Set with over 8 hours of RV instruction! This online e-course is packed with information on caring for and maintaining your RV tires. Video host Mark Polk explains tire inflation, tire inspection, overloading, tire maintenance, how to decipher the tire sidewall and much more in this informative online RV tire e-course. Total Run Time is 18 minutes 40 seconds. This affordable online e-course is priced at only$6.99. RV Videos on Demand Tip: Replacing one tire on a motorized RV, due to lack of routine maintenance, can cost you 30 times the price of this e-course. RV 101 Tip: Repairing water damage on the RV roof can cost upwards of 160 times the price of this online e-course. RV batteries are one of the biggest headaches for RV owners. Much of the reason for this is the lack of understanding of what a battery is, and how to properly maintain battery(s). In this battery primer e-cours Mark Polk walks you through all of the battery basics. You will no longer wonder what a battery is or how to perform basic maintenance on a battery after viewing this online e-course. This Battery Basics e-course is over 10 minutes in length and is priced at only $4.99. RV 101 Tip: Replacing one RV battery can cost 20 times the price of this e-course. Backing any trailer can be frustrating and a 5th wheel trailer is no exception. Let Mark Polk show you some excellent tips and techniques for backing a 5th wheel trailer, saving you time, headaches and possibly some money. This is one online e-course that is easily worth 10 times the low cost of only $5.99. Total Run Time is 11 minutes 50 seconds. RV 101 Tip: The backing techniques demonstrated in this online e-course can also be applied to backing a conventional travel trailer. 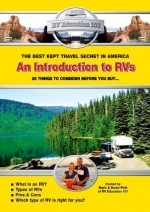 Let hosts, Mark & Dawn Polk, walk you through an introduction to RV’s. 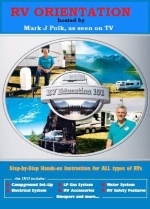 Learn what an RV is, which type of RV is right for you and your family, and some important things to consider before you buy an RV in this information packed DVD by RV Education 101. Owning and traveling in an RV is great, but just how does an RV work? How do you get hot water, cold food and TV when you’re out in the middle of nowhere? How is it possible to use a have electricity when you aren’t plugged into an electrical source, and what makes the shower work when you aren’t even connected to a water source? That’s what this e-book is for, to answer all of these questions and more about what makes things in and on your RV work.. This is a computer download.